Do you have real superpowers when it comes to knowledge of superheroes and their villainous adversaries? Prove it by taking our fantastic free superhero quiz below. Don’t forget to share your results with your friends and family then they can try and out-superhero you! Which superhero's real name is Peter Parker? Which superhero has a butler called Alfred? Diana Prince is the civilian identity of which superhero? Which superhero's only weakness is kryptonite? Which villain, an adversary of Batman, has the real name of Pamela Lillian Isley? Which superhero owns a company called Stark Industries? Which superhero gets their superpowers from their power ring? Which superhero's real name is Arthur Curry? Which superhero works as a lawyer in his day job? What is the real name of The Incredible Hulk? Which race of extraterrestrials are the founders and leaders of the Green Lantern Corps? Which female villain is The Joker's former psychiatrist? Which superhero gets his superpowers from his enchanted hammer Mjolnir? Which of the following superheroes is not a member of the Fantastic Four? Oh dear! Your superpowers seem to have deserted you! Not exactly a superheroic result! Hey, you've got some real super knowledge, haven't you! 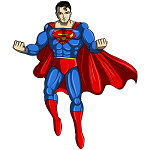 You're a real superhero when it comes to quizzes!